FOR a number of years we have warned that EPO criticism from Google-owned (and Google-operated) platforms like Blogspot or Gmail may be a tad risky. It isn’t much of a problem for those who do this under their real name, as Catarina Holtz has just done (she does not have much to lose). The relatively high-profile Catarina Holtz (not to be confused with Alexander Holtz, the SUEPO lawyer) cannot be punished anymore, so she spoke her mind out this weekend. One response to her said: “Awareness of the ECHR is high, hence our disbelief when VP1 said that the EPO complies with it – with a straight face, in his own language, but with a very nervous sip from a glass. Clearly, the EPO cannot, whatever it says, comply with the ECHR because this is unverifiable, and it is not subject to it. That’s the important part. In fact, Battistelli’s claim that he can do what he likes is absolutely true – and he did, showing the world precisely why the Convention was instituted in the first place. 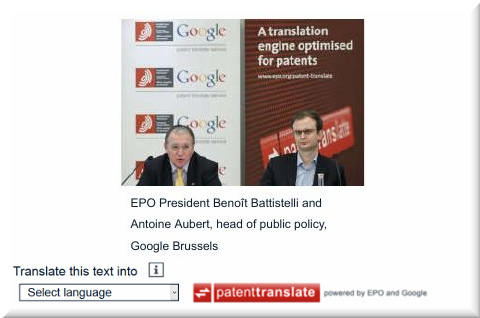 To use the words of a reader: “When you view a patent document in the EPO’s Espacenet service, you will be offered the possibility to obtain an automatic translation. A hint to the answer is included at the top of this post. “Conclusion,” our reader said, is that “there is a quid pro quo between the EPO and Google. Remember that Gmail and Blogspot are owned by Google. We mentioned this issue before. CRG/IU (Control Risks and the Investigative Unit it collaborates with) gained access to Google’s Gmail material in the past in order to press/bolster an indictment (we are not sure how exactly) and Blogspot has a history of giving away IDs of users once pressured, e.g. by a court.